The thing about being on the Neil Armstrong, especially if you are new to ship life like me, is that it does kind of feel like being at a show. 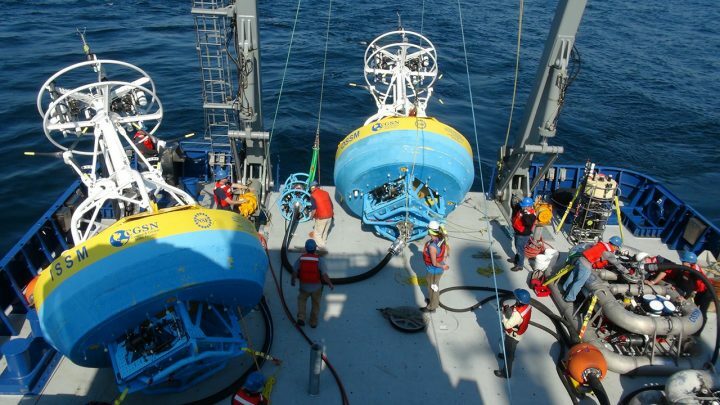 In the case of this cruise, the final leg of a three-leg expedition to service elements of the National Science Foundation’s Ocean Observatories Initiative (OOI), the venue is the Coastal Pioneer Array, located about 60 miles south of Martha’s Vineyard. It’s a big stage—the site is a large rectangle that spans the edge of the continental shelf and slope—but there are a lot of players. Each of those players has their role, and for the show to go seamlessly, everyone has to play it well. 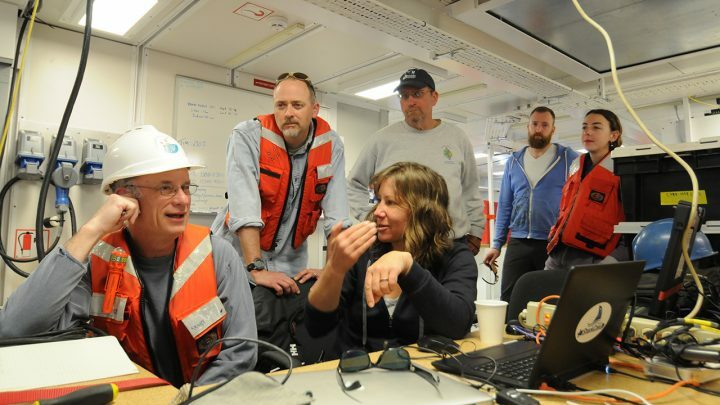 The director is Al Plueddemann, Chair of the Physical Oceanography Department at WHOI and chief scientist on all three legs of the expeditions. Director’s notebook in hand, Plueddemann is in charge of ensuring that the cruise’s 27 objectives are completed within his allotted ship time. He also works closely with the producers: the crew, who watch over what goes on, from the wall-to-wall windows on the ship’s bridge, to the large, open back deck, to the windowless engine room below. This onboard team is led by their executive producer Capt. Derek Bergeron, who combines the ship’s navigation technology with the science team’s instrumentation to ensure that the production goes off as seamlessly as possible. 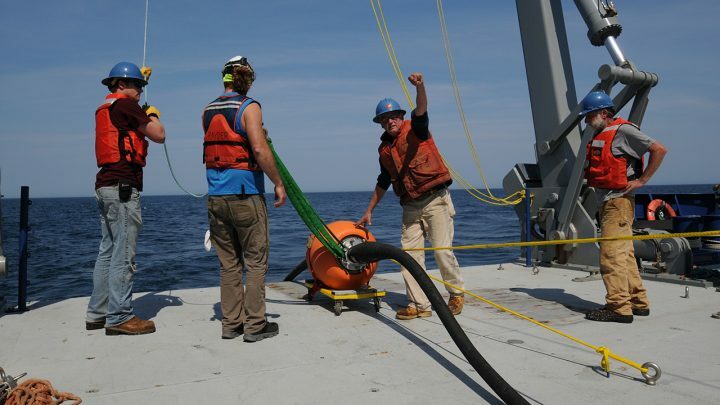 Although we departed Woods Hole on Thursday afternoon, the first act of this week’s show didn’t begin until Friday morning, when the deck crew, led by Kemp and the ship’s bosun Peter Liarikos, deployed a 10,000-pound Offshore Surface Mooring from the fantail, followed by a 12,000-pound Seafloor Multifunction Node that is connected to a buoy through a stretch hose and that will sit on the seafloor to collect data about the ocean’s physical and biological processes. When it comes to deck operations, Kemp is both a choreographer and a principal actor: he plans out the performance the night before—who will operate the winch, when the lines will be untied, and the exact spot the ship will need to be in when the buoy goes into the water—and then orchestrates the whole thing on deck. It’s exciting to watch and well worth the three-hour runtime. Kemp and his team performed so well that there was an encore the next morning, this time at the array’s much shallower inshore site. First, however, it was Brickley’s turn to go onstage. With the help of Kemp and several other engineers, Brickley deployed several gliders off the back of the ship. 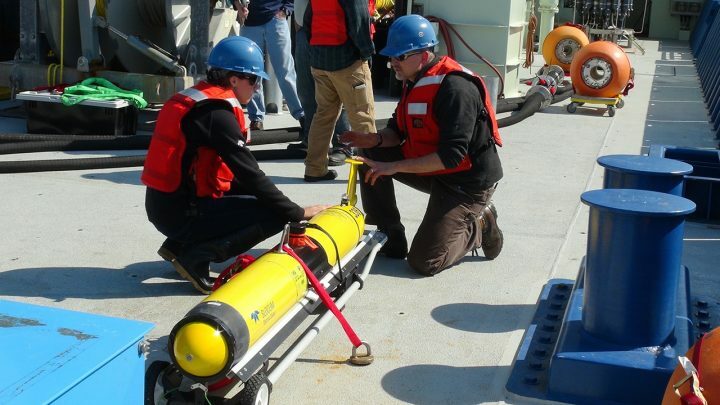 Though their part can’t be seen on the surface, the gliders’ job is to collect data in the area surrounding the array, moving up and down the water column as they go. The first deployment occurred on Saturday afternoon, but for engineer Amy Kukulya, there was a long wait backstage until her cue on Sunday morning. 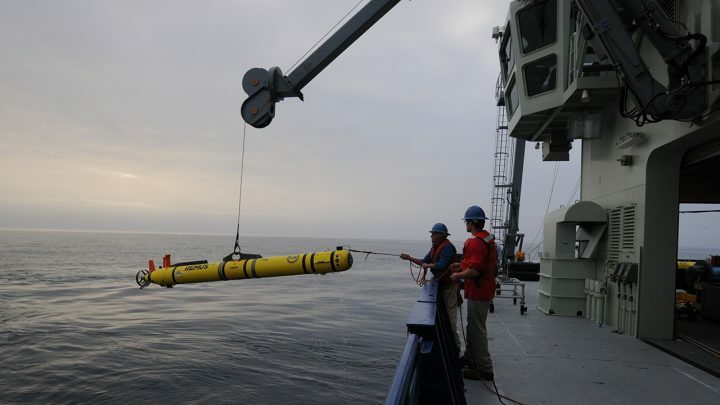 Kukulya’s role was to deploy a REMUS 600 autonomous underwater vehicle (AUV), which traveled 45 kilometers from the offshore to the inshore sites, collecting data alongside the ship before it was recovered in the early evening. By now, many others on the ship have finished playing their parts, and so don their hats and vests only to watch or to be ready if the day’s principal actor needs a hand. Although each act is interesting to watch, all eyes are concentrated on the star performer: the ship itself. Several science verification cruises took place over the last few months and were designed to test the Neil Armstrong’s capabilities, kind of like a dress rehearsal. On this cruise, however, the expectation is not only that the people on the ship know what their job is, but also that the vessel itself is prepared for the tasks it will perform. The Neil Armstrong was only recently introduced into the world of oceanography, though, and expectations are high. Luckily, the ship doesn’t seem to be suffering from performance anxiety. 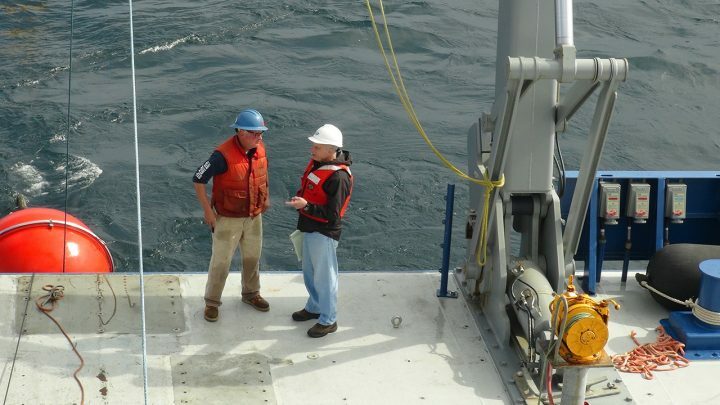 Both Plueddemann and Kemp took part in previous science verification cruises and made sure the vessel was up to the demands they would place on it. As Kemp put it, by the time they boarded the Neil Armstrong for the first leg of the OOI cruise, they knew what they were getting into. For many of the crew who spent years on Neil Armstrong‘s predecessor, R/V Knorr, it is impossible not to compare the two. 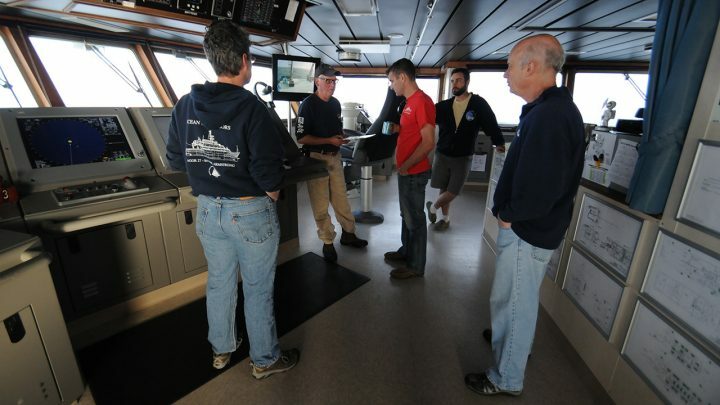 Though the new vessel is smaller, it has a bigger working deck and is well suited for the amount of hardware required to maintain an observatory as complex as the OOI Coastal Pioneer Array. After a few more short verification cruises in June, the Neil Armstrong will be headed out on a month-long expedition to one of OOI’s Global Arrays in the Irminger Sea near Greenland. These northern seas will pose a more extreme environment than the Coastal Pioneer Array and will be an even bigger test of the vessel’s ability. The significant time that has been spent rehearsing allows for widespread confidence that the ship will perform well even under those extreme conditions. As an aspiring ocean science communicator who’s never been to sea before, I’m still a little star-struck over the Neil Armstrong. In this production, I’m essentially a member of the audience, but my vantage point high above the main deck has plenty of advantages. I get to see it all happen without the pressure of those on stage, I get to hang out backstage with the cast and crew, and I can ask as many questions as I want at the post-show Q&A. It’s a trial period for the seafaring life. So far, I’m pretty happy with it.